What a band Strange Fruit would be…if only they were real! The film Still Crazy chronicled the tale of the fictional band, Strange Fruit. The Fruit were led by brothers Brian and Keith Lovell (guitar and lead vocals respectively). When Keith died, they carried on with new singer Ray Simms (Bill Nighy). The inevitable internal tensions led to the band’s demise. However in 1998 there was enough interest to get the band back together — minus Brian, who is assumed to have also died. The surprisingly emotional film boasted fine performances from Nighy, Jimmy Nail, Billy Connolly, Timothy Spall and more. The key however to any movie about a fictional band is to come up with a soundtrack of original material that sounds like it could be classic. Still Crazy accomplished this. You wish for Strange Fruit to be a real band, so good are the songs. 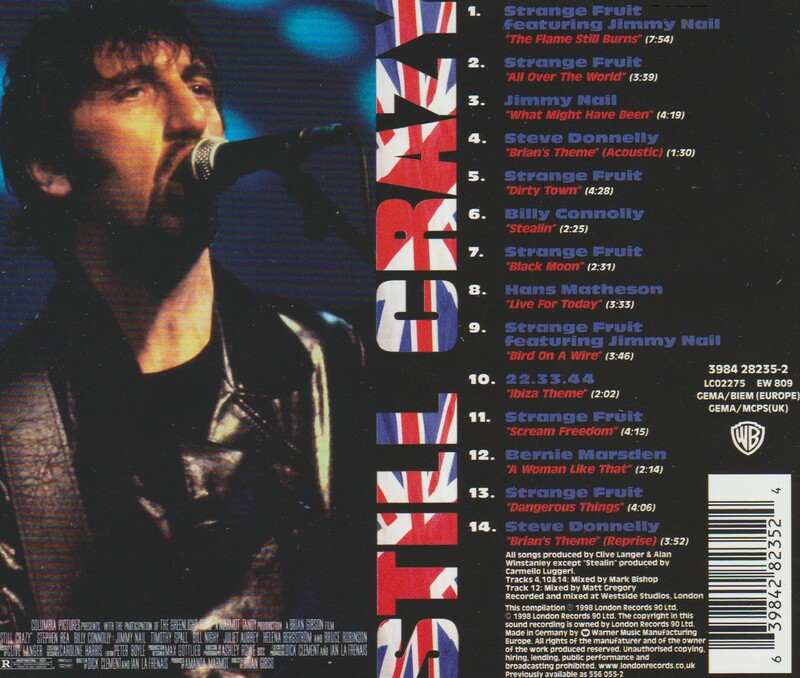 The ballad “The Flame Still Burns”, which in the fictional movie was written by bassist Les Wickes for the fallen Keith, is sung by Jimmy Nail in real life. (The song was written by the team of Mick Jones, Marti Frederikson, and Chris Difford.) This fine song is a perfect example of something that sounds like it must have charted somewhere many years ago. In the film, this song is the cause of much tension between Les and Ray, who did not want other band members to sing lead vocals. The beautiful thing about Still Crazy is that there is a tremendous amount of history to the band, most of which is not seen on screen, only felt through the actors portraying the memories. Jimmy Nail sings another sorrowful ballad, “What Might Have Been”, and does a fine job of it. It’s a lovely acoustic song with a little mandolin and another standout performance by Nail. He gets a chance to sing an upbeat number with “Bird on a Wire” (not that “Bird on a Wire”). This is a darn fine Wilburys-like rock tune. To be clear, Strange Fruit are not a ballad band even though “The Flame Still Burns” is clearly that. Strange Fruit are a rock band, and “All Over the World” is a prototypical set opener. Bill Nighy would make a damn fine rock frontman, if he wasn’t too busy being a fine film actor. It’s not about the notes he sings but the style in which is he sings them. Nighy sounds like a veteran rock singer (and in the film, you believe it 100%). The track “Dirty Town” has a nifty little riff reminiscent of “Layla”, but this track sounds more like 80’s Deep Purple, right down to a blazing guitar solo. “Black Moon” verges on heavy metal. If you’re wondering why it rocks so hard, it probably because of Michael Lee on drums. It’s Purple, Sabbath and Cream all in one. Nighy gets to be a heavy metal demigod on “Scream Freedom”, which was one of the funnier scenes in the movie. The best Fruit tune might be “Dangerous Things” which plays in the movie like it’s one of their biggest hits. This too has Michael Lee on drums, along with bassist Guy Pratt. That’s some heavyweight talent, folks. A movie with Billy Connolly in it is twice as good as a movie without (studies have shown). A movie with Connolly singing in it is four times as good. The traditional “Stealin'” is a fine fit for the Big Yin and his banjo. There is even a great vintage-sounding rock track by Bernie Marsden (ex-Whitesnake) that is plenty of fun (“A Woman Like That”). This is incidental to the main feature, which is the host of Strange Fruit tracks, but a nice inclusion. Unfortunately the techno track “Ibiza Theme” doesn’t fit the disc at all and can be safely skipped by most listeners. 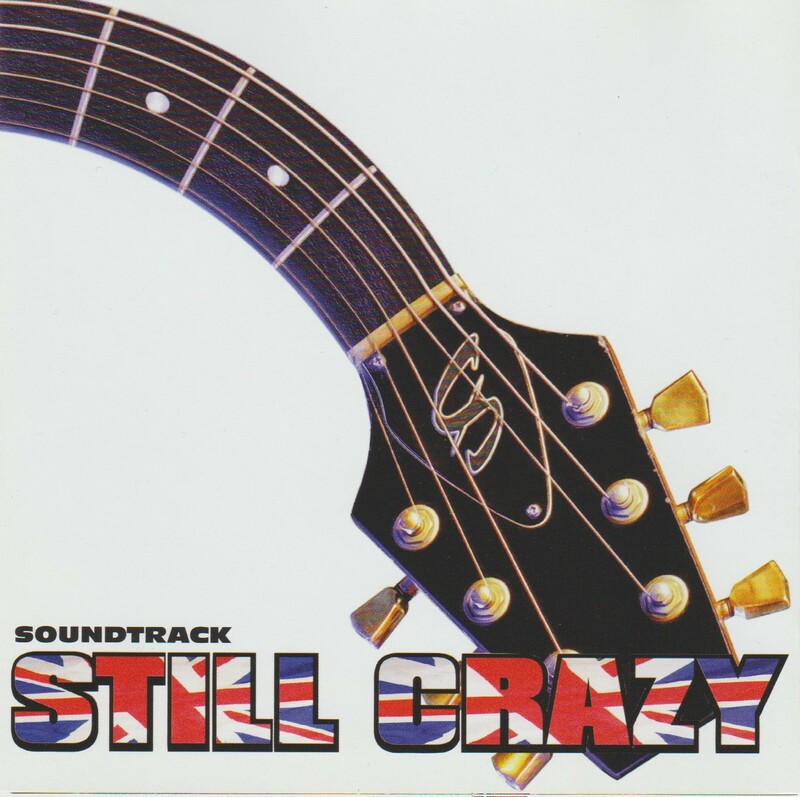 Admittedly, the Still Crazy soundtrack is more enjoyable if you have seen the film. When I hear “Dangerous Things” I picture things that Nighy as Ray does on stage. “The Flame Still Burns” is more powerful when you remember the friction it caused because of petty jealousies. Regardless, these songs were all written and performed by professional musicians, and they do stand up as individual tunes. Memorably so. A clunky warm-up gig on a tiny stage somewhere in Europe, Bill Nighy’s character, desperately trying to recapture the Frootz vibe but clearly struggling, thrusts his mike stand skywards… and looks up in dismay as it disappears into the ceiling in a shower of plaster. Thank you for a damn fine review of an excellent film. I missed all these comments before. Been a busy few weeks! Thanks for hosting, Bruce. I really enjoyed this. Forced me out of my comfort zone. And that is always healthy! I’m going to have to listen to this soundtrack and see the film. Absolutely do so. Although the soundtrack isn’t easy to come by the movie should be available. Damn good Mike. Mrs 1537s favourite film. Then that is proof that Mrs 1537 has good taste in everything, because she clearly knows how to pick her bloggers! Aw man! Such a great film, but I have to admit my ignorance when it comes to the soundtrack. I never even thought to explore the music further than hearing it the film. A damn fine film. Put me in the mood to track it down! When I saw the movie I was immediately drawn to the songs. So that naturally led me to want to get a full CD of them. Same thing with Spinal Tap actually…I had to get the soundtrack because I really liked those songs! I knew nothing about this until this post. Holy mackerel! Bill Nighy! This was the first movie I saw him in, but the guy I did know and love was Billy Connolly. Yes you did! I sent you a track on one of our mix CDs back in the day. I think you had a similar comment at that time too. LOL! Does the old mixbrothers site still exist somewhere? I can show you what I mean. What a great cast. Can’t believe I haven’t heard of this, even though I would have had no interest in it back in 1998. Well Matt it’s a timeless film, so now or ’98 it’s just as fitting! Some say I deserve a kick in the teeth! I don’t think that. You are a cool dude. I don’t think I’ve ever seen this movie! Do you like Bill Nighy? (Of course you do.) Then go for it!